Our guide to Irvine will help you find the best frozen yogurt shops in Irvine California. There are tons of great frozen yogurt shops in the city of Irvine, our city guide will help you find the best frozen yogurt shops. You may have a hard time deciding what to do in Irvine, but we make your decision easy. 14413 Culver Dr, (949) 552-7707 - When people think frozen yogurt, they think Golden Spoon. That's because we offer the ultimate frozen yogurt experience. 14775 Jeffrey Rd, (949) 857-0884 - Yogurtland offers a tempting blend of choices, image and value – a unique mix that's arrived at the perfect time. 15333 Culver Dr, (949) 551-6130 - Menchies Frozen Yogurt Culver Plaza is a frozen yogurt shop located in Irvine CA. 15475 Jeffrey Rd, (949) 559-5971 - Chillzone Naturalfrozen Yogurt is a frozen yogurt shop located in Irvine CA. 2700 Alton Pkwy, (949) 387-1888 - Come in and have a cup of our all natural non-fat frozen yogurt! 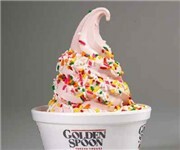 5365 Alton Pkwy, (949) 784-4871 - When people think frozen yogurt, they think Golden Spoon. That's because we offer the ultimate frozen yogurt experience. 83 Fortune Rd, (949) 753-9220 - When people think frozen yogurt, they think Golden Spoon. That's because we offer the ultimate frozen yogurt experience. Portola Pkwy, (714) 665-2422 - When people think frozen yogurt, they think Golden Spoon. That's because we offer the ultimate frozen yogurt experience. There are plenty more frozen yogurt shops in Irvine. See all frozen yogurt shops in Irvine California.